Because no two pieces of slate are exactly alike, you can count on your slate wall fountain to be one-of-a-kind. Slate is one of the most popular materials used in a wall mounted fountains and waterfalls. The slate is quarried in India and hand finished for a unique textured look. You can choose from green slate, black slate, or a stunning Multi-Color slate (Rajah) that has a mixture of shades of reds, golds, greens, and rusts. 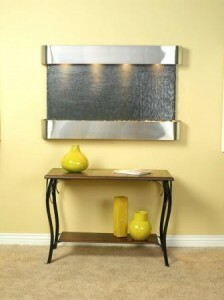 Slate wall fountains come in one, two, and three-panel designs, and are available with multiple framing options. Slate wall waterfalls also come in lightweight design (feather stone) that uses thinner sheets of slate that are fused together with a pliable, state of the art, backing. This process greatly reduces the weight of the fountain while maintaining the natural beauty and uniqueness of the slate. This also increases the flexibility of the slate which adds additional design options that are not possible with the larger slate slabs. These are often what you see in the 4 panel models.